As a high school student, Angelica Esquivel didn’t think college was for her. Sure, it seemed prohibitively expensive. But mostly she figured the challenges to obtaining higher education as an undocumented student were insurmountable. When answer came back an unequivocal “yes,” Angelica wasted no more time in pursuing her education. 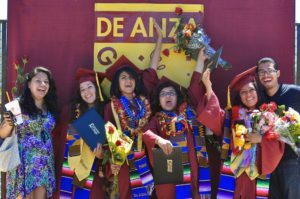 “I started at DeAnza in 2009 and right away I joined the student club for undocumented students, called I.M.A.S.S., that was just getting started,” she said, using the group’s acronym, which stands for Integral Movement for AB 540 Student Success. “That’s where my activism started,” Angelica said. Through I.M.A.S.S., she learned about the Vasconcellos Institute for Democracy In Action (VIDA), which in turn introduced her to Cynthia Kaufman, VIDA’s director. Cynthia informed her of the certificate in Leadership and Social Change (LSC) program, which was just starting up in the fall of 2011. After joining the LSC program and becoming an intern with VIDA she worked on institutionalizing a resource center at De Anza Community Colleges. The resource center is called Higher Education for AB 540 Students. 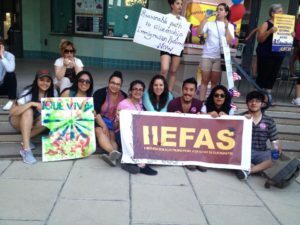 (HEFAS) and has been serving undocumented and low-income students for the past 4-years now. By the time Angelica enrolled in the LSC program, it was already her fourth year on campus. “I was already really active in movements on and off campus, mostly around immigration,” she said. But being part of the LSC cohort helped her connect more with students who were similarly active and passionate, but on a whole array of community issues. Angelica’s first job after obtaining her four-year degree was with a social justice nonprofit called Transnational Institute for Grassroots Research and Action (TIGRA). Even though she was new to the professional non-profit world, she felt her classwork through the LSC program gave her a leg up in her new position. This past November, for instance, she started working at San Mateo Adult School, which is part of the San Mateo High School District as a college and career counselor. Here, too, she’s found opportunity to apply what she’s learned through LSC to her community change work and professional life. In particular, she’s found the ability to list the certificate on her resume as a conversation started in the interview process. Her time in LSC has also provided her with a surprising source of comfort, given the current political environment. Angelica says she, like many around the country, is concerned about the potential reversal of the Obama-era Deferred Action for Childhood Arrival (DACA) program, which allows her and other children of undocumented individuals to work and study legally in the country. But the LSC program, she says, helped her to build the confidence to face whatever the future has in store. For now, Angelica is back at De Anza Community College as the Program Coordinator for VIDA. She says she is honored to return and work with the program that gave her the tools to become a change agent in the community and pass the knowledge to current and future LSC participants. She is also the Director of HEFAS, the program she co-founded, which is now part of VIDA.